My last "Help me pick tires" post, I swear. 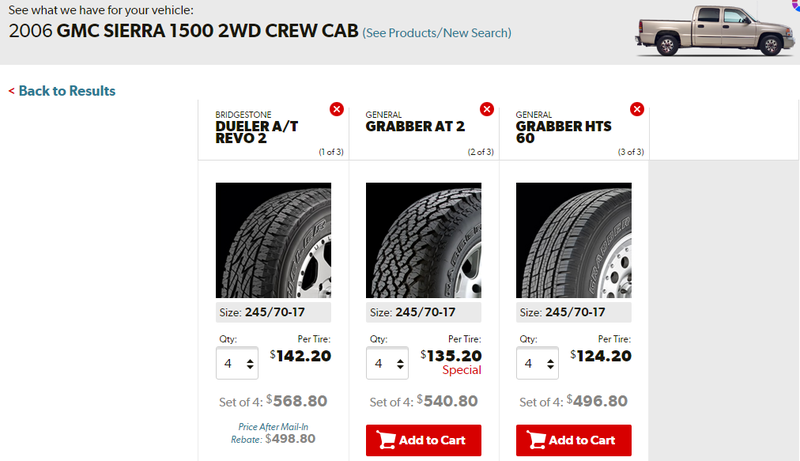 Based on online reviews (including the many suggestions of the good people of Oppo), price, and availability at Tire Rack, I’ve narrowed down my choices to these three tires. Just to review, my truck is 2wd and rarely leaves the pavement. While I do currently own a set of Blizzaks for the winter which I love, the amount of driving I do has dropped enough that I may just go back to leaving on all seasons after next winter (I can get one more season out of my Blizzaks). Many of you suggested the General Grabber AT2, and the online reviews are great. While I hated the General Ameritracs that my truck originally came with, I loved the General Altimax RT43s that I put on that stupid ‘11 Malibu I had for a while. Do I really need an AT tire? No, but I dig the way they look, and everything says on road behavior is very good too. The only real downside is they are pricier than the others. A couple people suggested the Brigestone Dueler A/T Revo2. I had initially overlooked this tire because of price, but a $70 mail in rebate makes it as cheap as any other name brand tire. The only Bridgestones I’ve ever owned are my Blizzaks, which I love. The tread looks a bit more highway friendly than the Grabber AT2, while still being pretty beefy looking. The other Grabber, the HTS 60, is a new version of the HTS. This is the cheapest of them all, and to be honest it’s the tire that’s designed for how I most use my truck. The thing that makes me a bit gun shy is they’re a really new tire, so there aren’t many reviews or much data out there about them. The old Grabber HTS didn’t have very good reviews, but General seems to have really stepped up their game lately. I’m leaning towards the Bridgestones. Thoughts/suggestions Oppo?